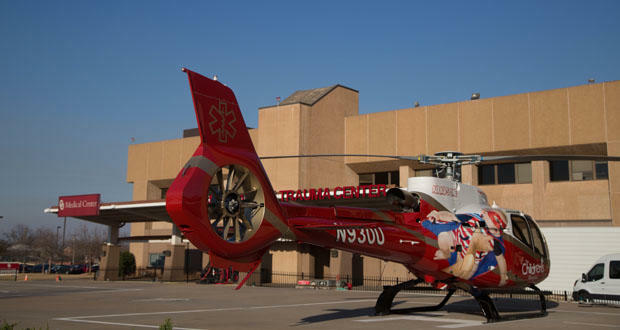 A helicopter is shown on a landing pad at OU Medical Center, 700 NE 13th St. in Oklahoma City. Oklahoma City’s two largest hospital systems chose not go ahead with proposed merger earlier this week. The University of Oklahoma Medical Services and SSM Health, the parent company that operates St. Anthony’s Hospital, announced on Monday that their proposed merger had fallen through. The two hospitals had announced their intention for a merger in October 2016. OU Medicine announced it would end its partnership with its current operator, Hospital Corporation of America Holdings, when the University Hospital Authority Trust completes the purchase of HCA Holdings’ interest in OU Medicine at some point toward midyear. The Journal Record’s Sarah Terry Cobo writes finding the right match for a hospital merger can be complicated. Health care attorney Mary Holloway Richard said a potential partner needs the business expertise as well as the financial backing to purchase a large teaching hospital. Oklahoma Hospital Association president Craig Jones says large hospital networks generally have advantages over smaller ones. Mergers give them economies of scale, so the cost information technology, for instance, can be reduced. Jones said the federal government has more regulations for teaching hospitals than non-academic health centers. The government recognizes the need for teaching hospitals and provides more funding than it does to non-academic centers. “But eventually you have to have one side (of the hospital) that subsidizes the other side,” Jones said. Jones said he suspects there is another potential partner that could succeed with a large teaching hospital like OU Medical System. Journal Record editor Ted Streuli told KGOU that incorporating a teaching hospital’s operations into an existing hospital system can be challenging. “Teaching hospitals tend to lose money by their nature, so there has to be another part of the business to essentially subsidize the academic part of the hospital and it can be really tough to incorporate that into a hospital that follows more of a standard business-like model,” Streuli said. Jacob McCleland: The proposed merger was between the University of Oklahoma’s medical systems, hospitals and clinic and SSM Health, the company that operates St. Anthony’s Hospital. Why did the merger fall through? Ted Streuli: It’s hard to say, really. Neither OU Medical nor SSM provided much detail in the statement that was released rather late in the day. They weren’t willing to answer any follow up questions, so pretty much the party line answer is, well, it just didn’t work out. McCleland: Journal Record reporter Sarah Terry Cobo looked into why hospital mergers face so many roadblocks. What did she find? Streuli: Well, some of the industry observers told her that the details of that kind of a deals are always really complicated, and it can be challenging to integrate a teaching hospital’s operations into another existing hospital system. Teaching hospitals tend to lose money by their nature, so there has to be another part of the business to essentially subsidize the academic part of the hospital and it can be really tough to incorporate that into a hospital that follows more of a standard business-like model. McCleland: How can hospitals benefit from merging? Streuli: That can really benefit from the economies of scale, right. The larger the organization is, the more you can spread costs for things like information technology or other upgrades in facilities. Large entities likely can get lower interest rates when they borrow money to do things like build new clinics. McCleland: How did the Affordable Care Act, or Obamacare, change the business model for OU Medicine? Streuli: Well for OU and for all hospitals, it changed the way doctors are reimbursed. Instead of getting a fee for performing a service, such as an office visit or a surgical procedure, it changed to so-called quality measures. Hospitals have had to prove that patients don’t get hospitalized again or don’t get sicker after the operation or the procedures. And that takes a lot more time. McCleland: Why are teaching hospitals typically more expensive to run? Streuli: Well there are many reasons, but one is because you’ve got physicians who are paid for doing work as doctors and then they’re also getting paid as professors because you have that academic element. McCleland: I want to take a detour into the bike lane, so to speak. Downtown Oklahoma City bike lanes are now painted bright green. Why did the bike lanes get a makeover? Streuli: Well it was really motivated by Safety. Motorists are more likely to see the bright green lanes and be more cautious around cyclists. But it’s also to signal of a shift that Oklahoma City is a bike-friendly kind of place. McCleland: Will marked bike lanes expand out of the downtown region? Streuli: They’ve said that they will eventually. The Bike and Walk Oklahoma City Master Plan is supposed to expand the bike lanes from the center outward. But that’s going to take a few years. McCleland: Is city hall making a concerted effort to boost bike usage? Streuli: Well, by implementing the green lanes, they are, certainly. Beyond, no real action from city hall.